Successful people create their own opportunities. NEW YORK (Money Magazine) -- Ever drive through a really wealthy neighborhood and wonder how those people got there? Sure, some inherited their way to the top, but once you put aside your initial envy you know that's not true of most of them. These people made it. Imagine if you could just park the car, walk up to a fabulous house, ring the bell and ask the owners for the secrets of financial success. That's where I found myself one day earlier this year: standing in the driveway of a towering waterfront home in Westport, Conn. (06880). Harvey Jason's Hollywood bookshop has been, accidentally, a runaway success. The promised land. I rang. A pretty blond woman, around 50, cracked the storm door. I explained that I was searching for the secrets of success. She stared, shrugged, asked if I was a psycho and bumped the door open with her knee. I walked into a living room filled with white light bouncing off the water. As Carole Reichhelm clutched a coffee mug with both hands, she leaned against her kitchen counter and asked, "Okay, what do you want to know?" This was the first day of a cross-country tour that had me ringing bells, slipping through gates and cajoling housekeepers over intercoms in five of America's most exclusive zip codes. Most people, of course, didn't want to talk. And I'll never know whether the owners of the large guard dog that chased me down a private road near Reichhelm's place felt like sharing their secrets. My guess is they keep to themselves. On the other hand, I did enjoy $20-a-glass Chardonnay while chatting with one of the richest women in Paradise Valley, Ariz. (85253) as the sun set over Camelback Mountain. A few weeks later, on St. Patrick's Day, I ate corned beef prepared by a Silicon Valley CEO's private chef (94027). All in all, I walked some 20 miles, rang more than 200 doorbells, almost got run over by three dozen SUVs, and spoke with 23 people who showed me that while accumulating vast sums of money isn't easy, it's a lot more possible than you probably think. Figuring out the lessons in their stories took a good bit of reflection after my tour was done, but here's an overarching observation that will become clear as you follow my travels: The fact that these millionaires were willing to open their doors at all explains a lot about how they got where they are. As for what they had to say, well, these are good people to listen to. I know. I've seen their houses. One of my most significant encounters, as it turned out, occurred not in a house but in a tiny shop called Mystery Pier Books, down a little alley off Sunset Boulevard. I stopped in to get out of the heat, and inside I found Harvey Jason, the affable British expatriate who owns the place. I told him about my walking tour, and his eyes lit up. Jason knows everybody in the business (he's married to Pamela Franklin, who once died on-screen in Brando's arms), but a decade ago he decided that he was ready to ease into a retirement gig. He was in Eureka, Calif., of all places, when he had the revelation, filming Steven Spielberg's The Lost World: Jurassic Park, in which he played a dinosaur tracker. Jason had visited a bookstore and was examining his loot when Spielberg looked over his shoulder. "Steven, I'm going to open a bookstore," Jason told the director. "I'm doing it." Jason was comfortable, but he didn't want to lose money on a new undertaking. Soon after opening Mystery Pier, he dedicated a corner to books that had been made into films - marrying the two things he was passionate about. 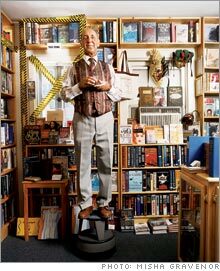 He spread the word among that vast network he had built up, and business took off as Hollywood A-listers stopped in for first editions of books that they or their friends had made into movies. Robin Williams, Jude Law and Bono became regulars. When I went in, Jason had everything from a full set of the Harry Potter books signed by J.K. Rowling ($40,000) to Humphrey Cobb's Paths of Glory inscribed by the star of the film version, Kirk Douglas ($6,500). "It was really an inadvertent thing," Jason said of the profitable market niche he had stumbled on. After a moment, he added, "If I made a list of all the things in life I thought were coincidences and then looked back at them, I would see that they weren't coincidences at all." Jason exemplifies the traits that British researcher Richard Wiseman ascribed to lucky people in a 2003 article called The Luck Factor: "They are skilled at creating and noticing chance opportunities, make lucky decisions by listening to their intuition, create self-fulfilling prophecies via positive expectations, and adopt a resilient attitude that transforms bad luck into good." In one experiment, Wiseman asked two groups of people - one who described themselves as generally lucky and one who said they were usually unlucky - to count the photographs in a newspaper. The unluckies spent several minutes flipping through and counting the photos. The lucky people got it in a few seconds. How? On page 2, Wiseman had inserted a message in giant headline type: "Stop counting - There are 43 photographs in this newspaper." The lucky people, always on the lookout for unexpected good fortune, spotted it right away. The unlucky people, whose minds are closed to such signs, missed it completely. Jason would have gotten the message. Plus: Do you have what it takes to be rich?